The Adventurer is our newest fedora, in the same general shape, style and color as the fedora worn by Indiana Jones in the "Indiana Jones" movies. Embark on your own adventure by bashing this open crown hat into the Indy shape shown here, or to another crease of your own choice. The open crown is 5-1/2 inches, the raw edge brim is 3-1/8 inches on the front and back, 2-3/4 inches on the sides. 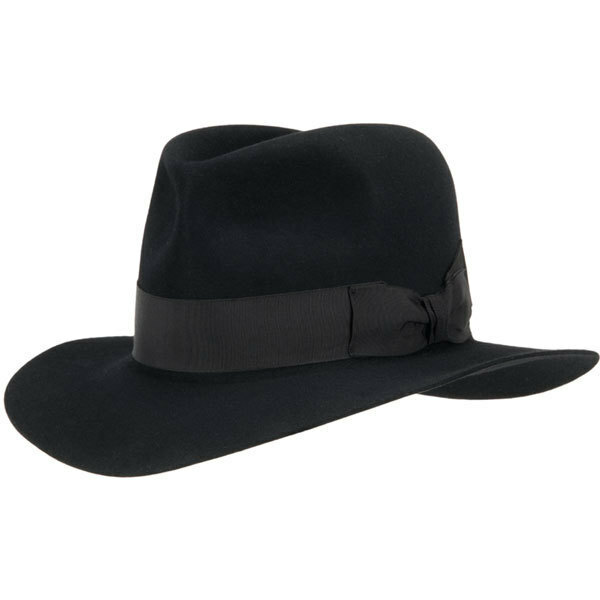 It is made in Akubra’s Imperial Quality fur felt in a mid brown color. It is finished with a matching 1-1/2 inch grosgrain ribbon band. Fully lined, with a reeded roan leather sweatband. This is a durable hat that will stand up to long-term hard use. Comes standard open crown, but we can shape it Indiana Jones at no extra cost, just let us know. Sizes: 6 3/4" to 8 1/8"